I love new things. Who doesn’t? A new book, a new job, a new experience. Even the smell of a new car. I love new possibilities and new opportunities. I love considering all that the “new” holds. But to be honest, I often have mixed feelings about new things. What if that new book isn’t that great and I regret buying it? What if the new job is worse than the last? What if the new experience falls flat? And what if the new year I’ve looked forward to is harder than the previous year? When I consider this new year—365 empty days waiting and ready to be filled with growth, opportunity, and adventure—I feel a mixture of excitement and anticipation, as well as some worry and apprehension. I look forward to what God will do in my life, the things I will learn, the ways he will stretch me and use me. I look forward to opportunities to be with family and friends and perhaps even make new friends. At the same time, I wonder about the hardships ahead. There are difficulties I face now that will likely intensify next year. There may even be unexpected difficulties ahead as well. While I don’t know what 2019 holds, I do know the One who holds it. I come before you today feeling a mixture of anticipation and worry. It’s exciting to turn the calendar page to a fresh new year. It’s exciting to consider all that the year holds. I look forward to new opportunities and growth. But at the same time, I wonder what heartaches and challenges lie ahead. And those heartaches I’ve faced this year, I wonder if they’ll continue into the next. I worry I won’t have the strength to endure unexpected change or trials. I guess I’m really not unlike the Israelite’s when they faced an uncertain future away from slavery and thought returning back to Egypt was a safer bet. Forgive me for my worries and fears about this new year. Forgive me for doubting your goodness and faithfulness. Forgive me for forgetting your constant grace to me and fearing it won’t be there when I need it in the future. Forgive me for forgetting who you are. While this new year may be filled with transition and change, you are the same yesterday, today, and forever. You never change and your promises remain true through every age. While I don’t know what this new year holds, you are the Alpha and Omega, the beginning and the end. You know the end from the beginning and every moment of this year to come. You know what 2019 holds and just what I need to journey through it. While I may worry about unknown challenges, and fear I am not ready to face them, you are a good and faithful Father. You only do what is good. Whatever the year holds, it comes from your goodness and will be for my ultimate good. While circumstances in my life may feel out of control this year, you reign supreme on your throne. You rule over all things. Nothing can happen outside your will and plan. You will never be surprised by anything that happens in 2019. Help me to rest in who you are this year. Help me to dwell on your goodness and faithfulness. Help me to rely on your sovereign power, knowledge, and rule. Help me to remember that you’ve gone to great lengths to meet my deepest need by sending your Son as a sacrifice for me—how could I think you wouldn’t meet any of my lesser needs? Help me to look at 2019 with hope and trust, knowing that whatever it holds, it is a gift from your good hands. 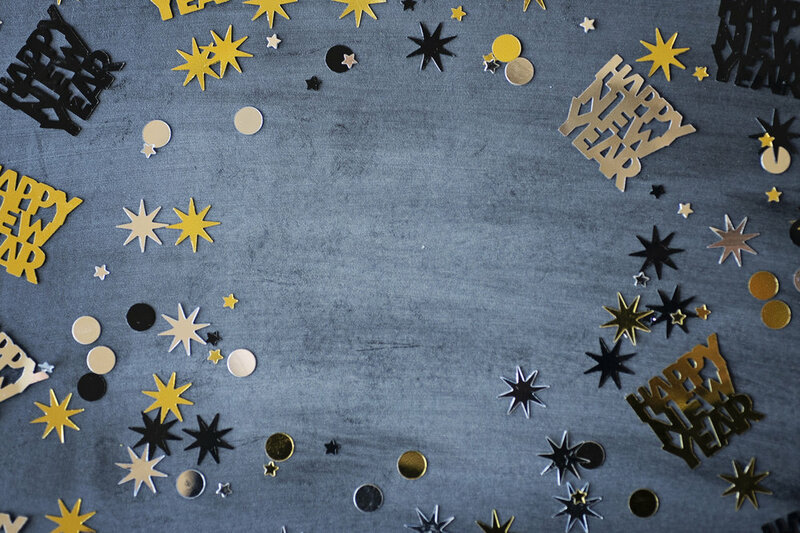 This new year may be filled with new adventure, change, and opportunity. It may also have some challenges and trials. But every new year is a reminder that you are making all things new. This new year will push forward your Kingdom here on earth and your ultimate return. That is something “new” I long for with great hope and expectation. I pray all this in Jesus’ name, amen. My life seems to be changing at a faster pace than usual. If it were possible, it seems as though someone pushed fast forward on the movie of my life. And I find myself unsettled by it. Out of breath at times. Spun around and disoriented. I took my oldest to the pediatrician for his annual visit and learned that he is 5 foot 11. How did that happen? Last I checked, he was still 5 and playing with Matchbox cars. I look in the mirror each morning and swear new lines and spots have appeared overnight. Not only that, but ever since I hit forty, my body has become a traitor. Every year there’s some new physical issue to deal with, some new thing that needs medical attention. Good things are happening in my speaking/writing ministry, but sometimes the pace is faster than I can keep up with. The world and culture around me often seems like a snow ball rolling down hill, growing bigger and stronger and unstoppable. I often feel out of place and out of touch. I wonder, how did we get here? I don’t know about you, but I’m not such a big fan of change, as least change I don’t have control over. I certainly like new experiences, as long as they are ones I’ve pursued and chosen, and that they arrive at a time that best suits me. In truth, I like to know what to expect. I like to be prepared. I like when things are manageable. I don’t like to be overwhelmed or uncertain or ill-prepared. And so, with my life in fast forward mode, I’m clinging to what is certain and steady. To what never changes. I’m looking to the horizon to keep me afloat in the whirlwind. I’m looking to God, the One who never changes. Unlike our lives, the Bible tells us that God never changes. “For I the LORD do not change; therefore you, O children of Jacob, are not consumed” (Malachi 3:6). The same God who spoke and light broke into the darkness is the same God who rescued his people from slavery. The same God who chose Mary to bear our Savior is the same God who met Peter on the shores of Galilee and said, “Feed my sheep.” The same God who gave grace to David in his sin is the same God who forgives us when we cry out in repentance. Yesterday, today, and forever, he remains the same. The God who greeted Moses in Exodus 34 with, “The LORD, the LORD, a God merciful and gracious, slow to anger, and abounding in steadfast love and faithfulness, keeping steadfast love for thousands, forgiving iniquity and transgression and sin” does not change in his character. No matter how much time passes, no matter what is going on in the world, our God— who he is—does not change. That means we can trust him to always be steadfast in faithfulness, generous in love, and rich in mercy. He is always good and always does what it right and just. Because God never changes, what he says does not change. Everything in his word remains true for all eternity. All that Scripture tells us about our world, our fall into sin, and what God did to save us, will never change. What the Bible tells us about who we are, what we need, and how God provides it, will never change. Whether people agree with God’s word or not, has no impact, for it is firmly fixed forever, “Forever, O LORD, your word is firmly fixed in the heavens” (Psalm 119:89). Into all eternity, God’s word remains: “Heaven and earth will pass away, but my words will not pass away” (Matthew 24:35). This means that all God’s promises for us will never change as well. When everything is changing around us, and it feels like we are riding in some kind of crazy spinning tilt-a-whirl, God’s promises to us in his word steadies us in the tumult. Promises such as: “For I am sure that neither death nor life, nor angels nor rulers, nor things present nor things to come, nor powers, nor height nor depth, nor anything else in all creation, will be able to separate us from the love of God in Christ Jesus our Lord” (Romans 8:38–39) and “I am sure of this, that he who began a good work in you will bring it to completion at the day of Jesus Christ” (Philippians 1:6) and “If we confess our sins, he is faithful and just to forgive us our sins and to cleanse us from all unrighteousness” (1 John 1:9). Change is part of life. Some change is good— the kind we look forward to and have long prayed for. Sometimes change comes into our life and knocks us over. There may even be seasons of life where changes come at us quicker than we can respond. But no matter the change, we can find rest and peace in our God who never changes. He remains trustworthy and faithful. His word and promises anchor us. Let us look to him.